Discover New Uses For Your Porter Cable! The porter cable is a multi-purpose machine and while many enthusiasts use it primarily to buff their vehicles, there are a variety of ways to apply your machine to household tasks. Wouldn’t it be great to utilize the power of the Porter Cable on conventional cleaning jobs? With the proper brush, you could find yourself cleaning carpets, upholstery or annoying grout without all of the sweat and elbow-grease. We use these brushes all the time to tidy up around our homes and personal garages, and its great to be able to keep working without switching tools – the porter cable has been doing almost all of our work for us lately. Almost. To attach these brushes to your Porter Cable 7424 or Griot's Garage 6 Inch Random Orbital Polisher, remove the backing plate using a wrenches included with the machines. Screw the brushes into the machine and tighten thoroughly. The brushes are threaded just like the backing plate. When you are finished using the brushes, unscrew them and rinse them out. Allow the brushes to air dry. From stain removal to home renovation, we offer you a brush that will transform your porter cable into an all-purpose dream tool come true. Grey Ultra Soft Upholstery Brush: This brush is designed for your most delicate carpet and upholstery. Works wonders on lush, leather interiors! Each bristle is split in to multiple fine tips, making it the perfect brush to use on headliners, leather upholstery, natural fibers, and carpets. Maximize your results by combining with DP Carpet & Upholstery Cleaner or Wolfgang Leather Care Cleaner . Aqua Soft Carpet Brush: This brush is phenomenal on carpet scrubbing. It has medium crimped bristles for gentle by thorough cleaning, making it suitable for a variety of jobs. It loosens and removes spots and stains from most types of carpet. Use it in conjunction with Stoner Carpet Cleaner or Wolfgang Carpet & Upholstery Restorer to exceed the expected! White Standard Carpet Brush: This brush is meant for jobs involving rigorous scrubbing. Particularly dense rugs and shag carpets are ideal. The bristles are stiff enough to remove old stains and they will hold up better than the Aqua Soft Carpet Brush on heavy-duty carpet. This brush works equally well on tile, grout, and floor pads but can produce exceptional results when used with 303 Cleaner and Spot Remover . Black Stiff Scrub Brush: This is the hardest brush we offer. 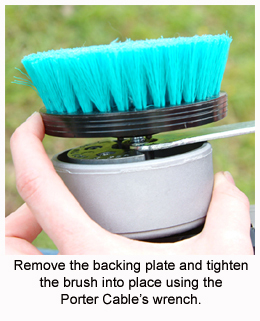 The black brush has very stiff bristles and is meant for the intense scrubbing of hard surfaces. Use it on tile, grout, stone floors, truck bed liners, tires and other areas in need of powerful, Porter Cable potency. Explore the versatility of your Porter Cable 7424 with the Carpet & Upholstery Brushes!